The Gateway- Radium Hot Springs, B.C. The Gateway , located on Highway 93, in the picturesque Village of Radium Hot Springs. 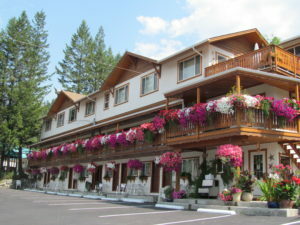 The Gateway is a small cozy property is set in the picturesque Village of Radium Hot Springs where the flowers and the scenery are as plentiful as the bighorn sheep that call it home. Located on Highway 93, The Gateway is, just a short 5 minutes from the entrance of Kootenay National Park and its world famous Radium Hot Springs. With spectacular mountain views overlooking the Columbia Valley, an afternoon can easily slip away relaxing in the warm sun. We take pride in providing reasonably priced accommodation, exceptionally clean rooms and superior guest service. At the Gateway all units are air-conditioned and equip with wireless Internet access. We have a range of rooms to meet your needs. Our rooms are the cleanest in the valley, 100% NON-SMOKING and exceptionally comfortable. The hot springs, restaurants, golf courses and hiking trails are only minutes away. So, why not spend some time in Radium Hot Springs at the Gateway and discover why we love to call this place home. We offer a light continental breakfast to all guests between 8am and 10am daily. There are a variety of baked goods (made fresh daily), fruit, yogurt, coffee and juice to choose from. We also offer traditional espresso and specialty coffees made fresh to order using only the highest quality locally roasted beans.